Happy New Year! I can't believe how fast the holidays came and went. As hectic as it all is, I get a little bummed when it's all over. Today is the last day of the "official" holiday break and tomorrow starts the first full week of work for me since before Christmas. Bleh. One thing I like to do on New Year's Day, besides make black eyed peas, is start a new batch of home fermented sauerkraut. If you've never had REAL sauerkraut, not the nasty stuff they sell in bags or cans at the grocery story, you have no idea of what you're missing. The real deal tastes more salty than sour and has a malty/fermented flavor that not only tastes wonderful, all those probiotics that you can only get from home fermented foods are so, so, good for you! Traditionally, especially further north and in Europe, sauerkraut is started in the fall and is allowed to slowly sit and ferment away all winter and into the spring. Fermentation does much better in cooler weather than warm, as there's a lesser chance of spoilage and a longer ferment equals more flavor. I like to start mine late in winter, as we sometimes have a warmer fall and I find that I'm usually too busy with other holiday madness to bother with it until after Christmas/New Year's. I did not make a batch last year, as we still had a few jars leftover from the previous year. Sauerkraut is one of those things that you either love or hate. I like to give it away when I have extra, which is usually the case for me. Only a few of my friends actually like sauerkraut, so we usually have enough to last a while. Sauerkraut is probably one of the easiest home fermented foods to make. You can make as much or as little as you want, and the bonus is that it can be canned and saved for future, grilled bratwursts and hot dogs over the summer. I make mine in my 5 gallon pickling crock and get anywhere from 12 - 18 quart jars of yummy sauerkraut when it's done. 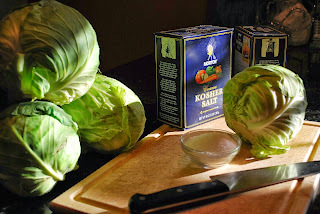 I follow the Ball Blue Book recipe for a simple cabbage kraut, but there are several more exotic recipes that include onions, apples, and other spices. The first thing you need to do is get a few heads of cabbage and kosher salt. Pickling salt can be used as well, but I prefer kosher. 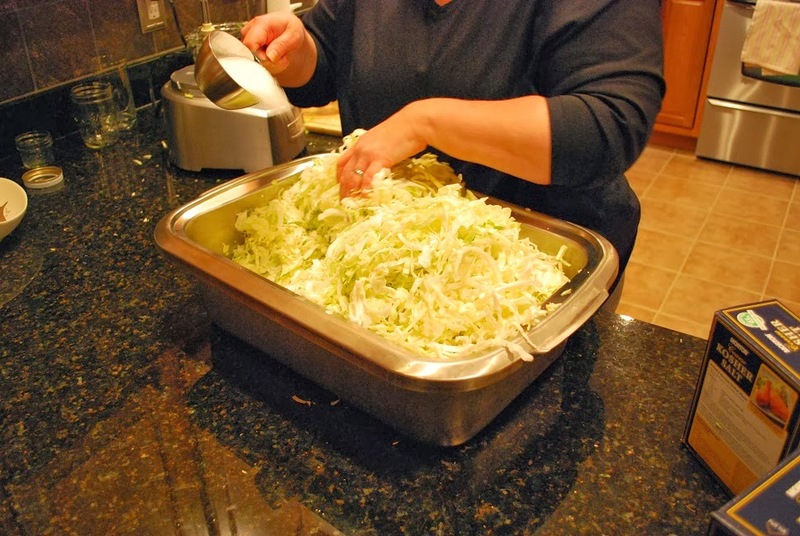 You'll need to shred all this cabbage and I find my food processor to be invaluable, but you can use a mandoline, a box shredder, or even a sharp knife. For my 5 gallon crock, I usually shred anywhere from 5 - 9 heads of cabbage, depending on their size and yield. Next, get yourself a big bucket, tub, or bowl to put all this shredded cabbage in to mix with the salt. I add 1 cup of kosher salt per 4 - 5 heads of shredded cabbage. I sprinkle this a little at a time and toss the cabbage around to evenly distribute the salt. After salting, I pack the cabbage into my pickling crock, Be sure the container you choose to ferment in is either glass or ceramic (non-porous) to prevent bacteria growth. 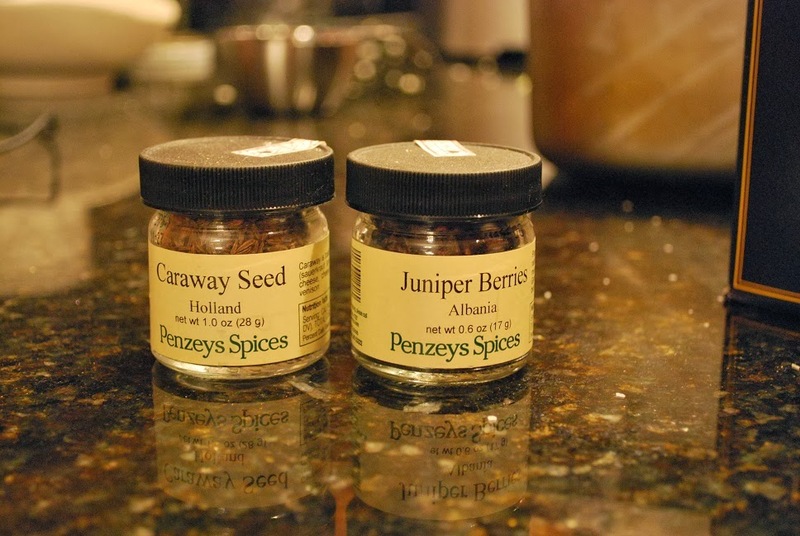 I then sprinkle a little dried caraway seeds and juniper berries randomly in the cabbage mix. This gives a more traditional flavor to the kraut, but it's optional. I do try to pack the cabbage in tight, as the salt will start pulling moisture out of the cabbage and create a brine. 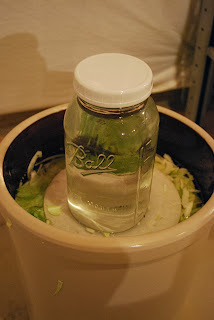 Eventually, you will want enough brine produced to completely cover all of the cabbage and prevent spoilage, but I always have had to make additional brine. Before adding the brine, I place about 3 - 4 large cabbage leaves on the top of the shredded cabbage to act as a dam to hold all the cabbage under the brine. 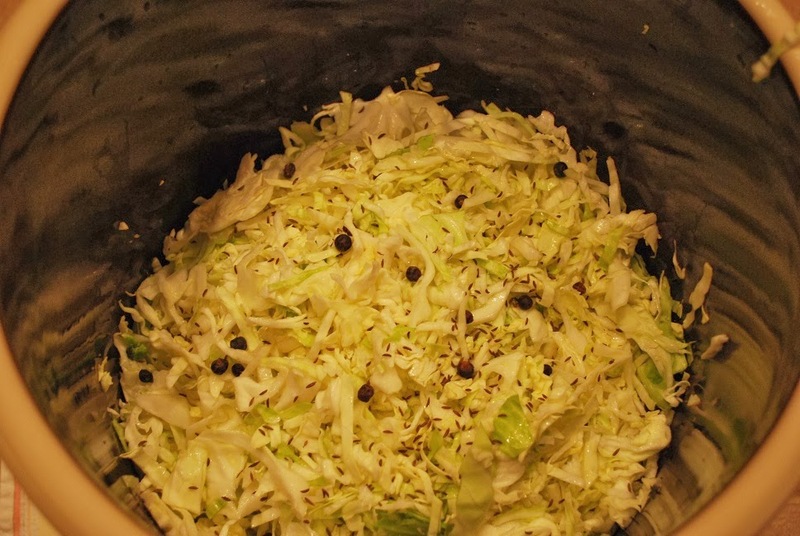 You do not want your cabbage floating around in the brine as mold will start to grow on the pieces exposed to air and will spoil your sauerkraut. Some pieces will float to the surface, but you can scrape them off as you find them during fermentation. To make additional brine, add 4 1/2 teaspoons of kosher salt to 1 quart of very hot water and stir to dissolve the salt. 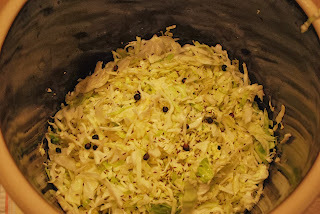 When it is cooled, pour the brine over the cabbage in the crock to cover about 1 inch. I usually wait until I have my entire crock filled with cabbage before I move it into place and add the brine (less weight and mess). Place your packed container in a cool and dark place for fermentation; a basement is perfect for this. After moving your container and adding your brine, place a large glass/ceramic (non-reactive) plate on the top to weight the cabbage down and ensure it stays under the brine. I also put a 1/2 gallon canning jar filled with water on top of the plate to make sure this happens. In the past, I've filled 1 gallon Ziplock bags with brine (not water) and placed it on top to weight down the cabbage, but either way works. Just be sure that if you use a Ziplock bag, fill it with brine and not water. A bag filled with plain water might leak and dilute the brine in the crock, which could spoil the cabbage. After that, be sure to cover your container with a towel or pillow case (what I use) to prevent debris, bugs, or curious cats messing with your beautiful sauerkraut-to-be. 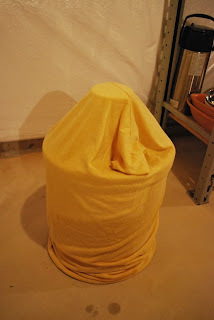 Whatever you use, just make sure your cover is breathable to allow for fermenting gas to escape. All you need after that is time! About once every week or two, give a peek at your sauerkraut and scrape off any mold or scum that may form on the surface of the brine. Don't worry if that happens, it is perfectly normal. You may also see tiny bubbles start to rise to the surface of the brine as this indicates that fermentation is taking place. Making sauerkraut in my basement takes 3 months (at approximately 50 - 55 degrees), but it could take longer or shorter depending on the surrounding temperature. Remember, cooler is better, but I once fermented a batch of sauerkraut in my kitchen in Florida in 3 weeks (at 70 - 75 degrees)! You'll know when your kraut is ready by the way it tastes (start tasting after 2 -3 weeks). It should taste salty, a little malty and tart, but not spoiled. The color should be pale gold and there may or may not still be bubbles still coming to the surface of the brine. So, now you have it. Go forth and ferment yourself some kraut! *Note: I will follow-up on this post and show how to can your sauerkraut once mine gets done! Thanks Samion! Homemade sauerkraut is a wonderful thing.